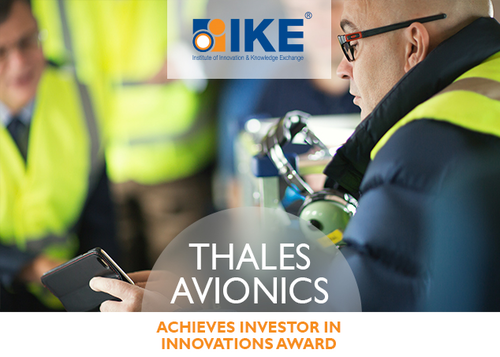 The Avionics business of Thales in the UK has secured the Investor in Innovations (I3) Standard awarded by the Institute of Innovation and Knowledge Exchange. Thales develops, manufactures and maintains a wide range of products and systems in the civil and military aviation markets including Avionics Satellite Communication Systems, Air-to-Ground Connectivity, Next Generation of Cockpit Communication Systems, Military Avionics and Degraded Visual Environment solutions. Thales is also a trusted partner to Defence forces and organisations around the world, providing innovative training and simulation products for the Air, Land and Maritime domains. The Investor in Innovations is an integrated, leading-edge standard that uses a structured and balanced framework to benchmark and validate an organisation’s innovation capability. It deploys a practical process that helps organisations to drive growth by providing a clear action plan to enable the organisation to constructively align its innovation efforts with the direction of the business strategy. Thales’ innovation profile was assessed in six key areas that included: Strategy and Alignment; Organisational Readiness; Core Capabilities; Technologies & IP; Industry Foresight; Customer Awareness; and Impact and Value. Thales is a global technology leader for the Aerospace, Transport, Defence and Security markets. With 64,000 employees in 56 countries, Thales reported sales of €14.9billion in 2016. With over 25,000 engineers and researchers, Thales has a unique capability to design and deploy equipment, systems and services to meet the most complex security requirements. Its exceptional international footprint allows it to work closely with its customers all over the world. IKE Institute is the professional body for innovators in the UK. It accredits and certifies innovation practices, and confers the Investor in Innovations® standard and the IKE Assured® accreditation. The Institute influences the inter-relationship between education, business, and government through research and collaborative networks. IKE’s Innovation Manifesto highlights its commitment to support the development of innovative people and organisations. IKE’s accreditation work is guided by the Innovation Council, which brings together over forty C-suite executives representing different economic sectors. Companies such as Thales UK and Panasonic (Research and Development) have also been through the Investor in Innovations Standard. Investor in Innovations® is an integrated, leading-edge Standard that offers a practical way for an organisation to assess, validate and benchmark its innovation capability. It uses a well-defined six-category Framework that brings together: strategy and alignment; organisational readiness; core capabilities, technologies and IP; industry foresight; customer awareness and impact and value. In addition, Investor in Innovations® is a business diagnostic, used to understand where an organisation is and where it needs to be from an innovation standpoint. A coherent Action Plan to close the innovation gap is a key outcome from this programme. This press release was distributed by ResponseSource Press Release Wire on behalf of Institute of Innovation and Knowledge Exchange (IKE) in the following categories: Manufacturing, Engineering & Energy, Transport & Logistics, for more information visit https://pressreleasewire.responsesource.com/about.